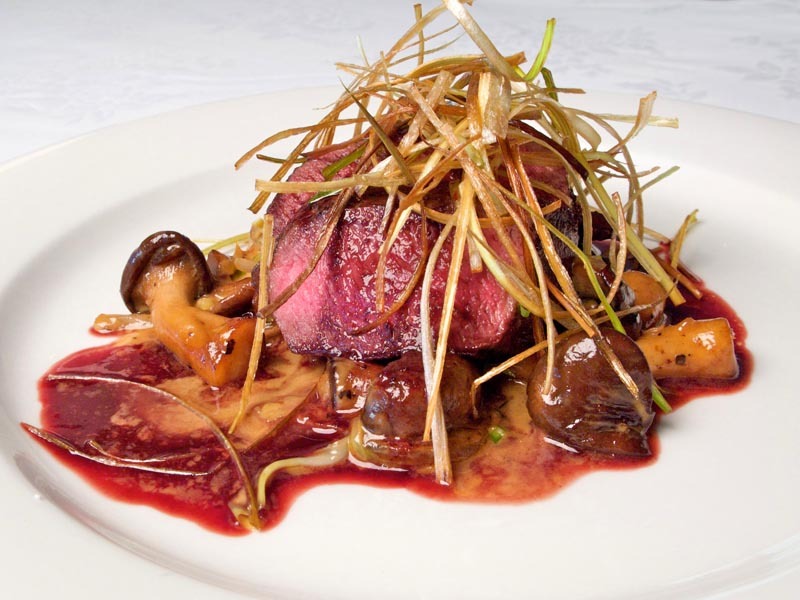 Judy-Lee’s gemsbok fillet, which she serves on a wild mushroom and cabbage fricasse with a port jus, is a magnificent winter dish. We’d never tried gemsbok before but decided there and then that this was one of the best venison steaks we’ve had. Gemsbok is not always available, but try a good butcher or speciality meats store and they should be able to assist. Alternatively, any good-quality venison fillet should be a fair substitute. 1 gemsbok fillet, about 300g; olive oil and butter for frying; ½ onion, sliced Chinese style; 1 clove garlic, crushed; 1 cup mixed wild mushrooms such as shitaki and porto bellini; 1 cup shredded cabbage; 1 cup good beef stock; 100ml cream; 1 cup port; a few sprigs rosemary; olive oil; salt and freshly ground pepper; deep-fried leek for garnishing (optional). Clean the fillet and cut it into two portions of about 150g. To make the fricasse, heat a little olive oil and a knob of butter in a pan. Slowly cook the onion buy metronidazole online usa until it is slightly caramelised. Turn up the heat and add the garlic and the mushrooms – you may want to add another knob of butter at this stage. Fry on a high heat until the mushrooms are just cooked, add the cabbage and stir-fry for 1 minute. Add a tablespoon of beef stock and the cream. Leave to simmer until the cream has reduced. Season. Heat a heavy based frying pan until almost smoking. Add a dash of olive oil and a knob of butter. Seal your meat well; depending on how you like your meat done, lower the heat and leave to cook a little. Remove the meat from the pan and leave it to rest. Deglaze your pan with the port, add the stock and a sprig of rosemary and let it reduce until thickened. To serve, spoon the fricasse into the middle of the plate, top with the sliced gemsbok and pour over the port jus. Top with deep-fried leek if desired.